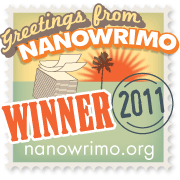 For those of you who are curious as to why I’m still checking in; NaNoWriMo is not over. My novel is done, but I’ve still been writing and I’m pleased to say that I’ve been editing too. Getting the first draft of my next ‘Meeting Each Other’ story down as well as editing my offerings for the anthology and a piece of flash I’m hoping to submit to a competition. Small things, y’know. I’m also using this week as a check in for other activities. I’ve been going through my ‘freelancing’ folder and decided that I really should get back to doing a bit more work. Paid work, that is. Obviously writing stories for publication is eventually (I hope!) paid work, but in the short term, if I want skates then I need to be doing more scribbling. In truth I’m quite looking forward to reflecting on November in my wrap-up and pointing my attention to December. In fact, the end of the year is looming (I tend not to think about it until Christmas is gone, but then you only have a week!) and I need to make some plans. I need decide where I’m going, what I’m doing, what I want! Don’t you just love that feeling? Planning and looking forward? Peering back and reminiscing? Anyway… in the meantime, I guess you need another sample from the SORB project. Hereeeeeeee we go! It took several seconds to realise that he was talking about prep for the wedding. It seemed a million years away that she was last thinking of what should go into the goodie bags and whether or not releasing doves at a pre-arranged moment was cliché. Another person. Another life. Again, the thought of her job was the furthest thing from her mind. She hadn’t enough thought about ringing Donna to explain her absence and it was only because of her father’s intervention the day before that she wasn’t in big trouble at the office. “Not the museum.” She murmured. He walked around the table. “Let go!” He wrenched against her grip, balancing himself as if he would be free, but Ileandra tightened her fingers and refused to budge. She saw the anger in his eyes. The the confusion as he pulled against her grip. Then the fear. His fear spiced the air like a good seasoning. Ileandra inhaled and felt the delicious scent of it strike a chord in her mind. Like picking a trio of piano keys to play an ugly chord. It struck her mind like a bell and left her trembling, fighting with the appearance of fangs in her mouth. Biting back a sob, she released his arm. Nick cradled the limb to his chest, holding it gingerly as though in pain. He gazed at her, shaking his head, before walking- no, running out of the room. Minutes later Ileandra heard the front door slam and knew she was alone in the house. He hadn’t even had a shower. This entry was posted in Ileandra's Posts, NaNoWriMo 2013, Silk Over Razor Blades and tagged Ileandra Young, nanowrimo, novel, planning, postaweek2013, sample, silk over razor blades, vampires, word count. Bookmark the permalink. 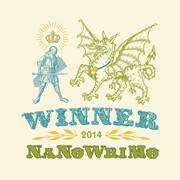 Well done with NaNoWriMo, btw. I hit 50,000 on Monday, but I’m pushing to see how much more I can get done in the next hour. Currently at 56,500, and the story itself is nowhere near finished! Nice excerpt – really good writing, and now I really want to read it! D’awww, thanks! Glad it’s keeping people intrieged. ^_^ Gives me confidence for my plans to publish mid 2014.